Well, I’ve just put my feet up for the first time in several days – the Kerrygold Ballymaloe Literary Festival of Food and Wine is over for another year. It was quite an event with thousands of people converging on East Cork for the weekend. Over 30 nationalities that we know of and as one hassled visitor complained to me ‘there wasn’t a bed between here and Cork’. Fortunately we found her one but the event certainly created a huge buzz and generated a lot of excitement in the greater area. There were many highlights…. the thought provoking 15 minute talks in the Grainstore on a whole range of topics. Food in a Warzone with Kamal Mouzuwak from the Lebanon, Seaweeds eat them, meet them with Prannie Rhatigan, Ella McSweeney chaired a panel on Farming the Soil, Prue Leith founder of Leiths Cookery School in London spoke about her life in food. Elizabeth Luard, Sacred Food was also riveting but one of the most thought provoking of all was Professor Ted Dinan of UCC’s talk on the relationship between our gut and our psychological wellbeing. Ari Weinzweig from Zingerman’s in Ann Arbor in Michigan’s talk was entitled ‘A Lapsed Anarchist’, his subject, how to create a successful business and a happy workforce. Many of these presentations will be up on the Litfest website within the next couple of weeks. The Big Shed where the Fringe takes place was rocking. The food stalls were specially selected for their ‘great food’. ‘My Goodness’s Heavy Nettle shot and an Irish take on pupusas made with potato, charlock and wild garlic was a huge hit as were Ivan Whelan’s sausage, egg and chips. Ivan had three fryers on the go, Choose Your Fat…. The Bloody Mary and Bloody Shame (non alcoholic) made from homemade tomato ketchup caused quite a sensation…. Arun Kapil of Green Saffron also had long queues for Spicy John Dory and salmon with peas and coconut flakes as did The Rocket Man’s falafel pockets. Lolo had his entire family serving crêpes and many other good things. Joe and Sandra Burns Farm Vegetable Chips and much much more……. The Ballymaloe gang did a brilliant job of giving chefs, speakers and guests a taste of the very best of Ireland. Can you imagine the sun shone on both days with only two thunder showers to remind us of how it could have been….but this column is about food and as ever there were many highlights among the cookery dems at the Cookery School and here are just a few, I’ll share some more with you all in the next couple of weeks. We discovered lots of new artisan products over the weekend. Graham’s Wholegrain Mustards from Co Meath are quite a find; they are made from a carefully selected brown and yellow mustard seeds and aged for 2½ months to let the flavours develop, the end result is really worth seeking out. Slice the top quarter off the head of garlic, horizontally, and discard. Place the remaining garlic in the centre of a square of foil, with 1 tablespoon of the olive oil and a sprinkle of salt. Wrap up the garlic, place it on a baking tray and roast for 30 minutes until soft. Set aside and, when cool enough to touch, squeeze out the garlic cloves, discard the skin and, using the flat side of a sharp knife, crush to form a puree. Set aside until ready to use. Place the spring onions in a bowl and brush with the sunflower oil. Sprinkle over 1/4 teaspoon of salt and a good grind of black pepper. Place a small griddle pan on a high heat and ventilate your kitchen. When the pan is smoking hot, add the spring onions and chargrill for 5-6 minutes, turning halfway through, until black and burnt all over. Set aside to cool, the finely chop. Transfer the spring onions to a bowl and add the cream cheese, soured cream, and the remaining tablespoon of olive oil, the roast garlic puree and the 1/4 teaspoon of salt. Mix well and set aside until ready to use. Put the oil for the kale into a large sauté pan and place on a medium-high heat. Add the garlic and chilli slices and fry for 4-6 minutes, stirring constantly, until crisp and golden-brown. Add the kale, along with 1 1/2 teaspoons of salt and a good grind of black pepper, and cook for 3 minutes – you might need to do this in two or three batches – stirring often, until the kale is cooked but still retains a bite. Remove from the heat, add the lemon juice and serve warm, on a large platter or individual starter plates, with dollops of the spring onions dip spooned on top. Farinata is a flatbread made from chickpea flour, which makes it gluten-free as well as delicious. The edges are dry and crisp, whilst the centre is more soft and squidgy, allowing you to scoop up the topping when you eat it. Start with either tinned or dried butterbeans here, which you then cook. Both work just as well. Place the chickpea flour in a large bowl. Slowly add 450ml (16fl oz) of water, whisking constantly, until well combined. Set aside for 20 minutes and preheat the oven to 240°C/ 475°F. Place all the ingredients for the whipped butterbeans in a food processor with 3/4 teaspoon salt. Blitz for 1-2 minutes, until completely smooth and aerated and then spoon into a small bowl. Drizzle with 2 teaspoons of olive oil and set aside. Add the oil for the farinata to a large iron skillet which will retain the heat well (if you don’t have one use a heavy-based, ovenproof frying pan). Place on a medium-high heat. Add the garlic and fry for 1-2 minutes, until it starts to sizzle but doesn’t take on any colour. Use a slotted spoon to transfer the garlic out of the oil to a small bowl. Add the sumac, nigella seeds and chilli to the garlic; mix together and set aside. Spoon 2 tablespoons of the garlic oil left in the pan into the chickpea flour batter along with 1 teaspoon salt. Whisk well and set aside. Tip 1 tablespoon of the garlic oil in the pan out into a separate bowl, leaving 1 tablespoon left in the pan. Return the frying pan to a high heat and, once the oil starts to smoke, pour in half of the batter, swirling the pan to form an even layer. Heat for 30 seconds, until the batter starts to bubble and then sprinkle over half of the garlic mix. Transfer the pan to the oven for 10 minutes, until cooked through and golden-brown. Use a spatula to remove the farinata from the pan and rest on a large plate. Keep warm (or you can return it to the oven for the last two minutes of cooking time for the next farinata) whilst you cook the second farinata in the same way, using the last tablespoon of garlic oil to do so. Slice into wedges and serve warm, with the whipped butterbeans alongside for spreading over. Acidic fruits, such as rhubarb, make great ice-cream flavours, because they stand up to the richness of a creamy custard. If you are making this ice-cream when the trees are still in blossom, throw in a few handfuls of petals (preferably not from the gutter) in place of the vanilla for a heady, honey-like hint. For best results, this should be made in an ice-cream maker. If you don’t have one, freeze the mixture until solid. In a heavy-based pan, warm the milk, caster sugar and vanilla pod, seeds scraped, until just beginning to bubble. This won’t take long, so while it’s heating up, put your egg yolks into a bowl and whisk. Pour the double cream into a large bowl with a sieve resting on top of it and set aside. When the milk is ready, temper the yolks by pouring a little of the milk into them, whisking as you go. Now pour the tempered yolks back into the remaining warm milk in the pan. Stirring continuously, heat until the mixture starts to thicken at the bottom of the pan. Strain the custard mixture into the cold cream and whisk well to prevent the custard from cooking any further. Cover and put in the fridge for at least 1 hour to cool. Heat your oven to 180˚C/350˚F/Gas Mark 4. Cut the rhubarb into batons and lay in a baking dish. Coat with the 180g (6 1/4oz) caster sugar and add the vanilla pod, then cover with foil and roast for 20 minutes. Remove the foil then roast for a further 20 minutes, or until the rhubarb is soft and falling apart. Allow to cool. Blitz the rhubarb in a food processor, then stir into the ice-cream custard base. Taste the mixture and add a squeeze of lemon juice or a pinch of sugar to adjust if needed. See tip about sweetness. Pour into your ice-cream maker and churn for about 20 minutes, following the manufacturer’s instructions. Freeze for 1 hour before serving. Peel the squash, slice it in half and scrape out the seeds and pulp. Lay the squash cut-side down and cut it into 1cm (1/2 inch) slices. Peel and cut the onion into eighths. Spread the squash and onion pieces out on a parchment-lined tray and drizzle with 3 tablespoons olive oil. Sprinkle with the chilli flakes, sprigs of thyme, salt and pepper. Bake for 20-30 minutes until the squash is tender and the onions are starting to caramelise. Heat the remaining oil in a frying pan over a medium heat and add the crushed garlic. Once it sizzles but before it goes brown, add the drained tomatoes and crush them up a little in the pan. Simmer for about 6-8 minutes, turning the heat down if it bubbles too ferociously. Whisk in the cream. Cut the Cavolo Nero into ribbons and mix it into the tomato sauce. Toss the roasted squash and onions into the tomatoey cream sauce. Turn off the heat and tip the mixture into a large round baking dish. Set it aside while you make the biscuit topping. Preheat the oven to 220C/425˚F/Gas Mark 7. In a large bowl, whisk together the two flours, the baking powder and the salt. Use a fork or your fingertips to mix the butter into the flour mixture until it’s the size of peas. Stir in the yoghurt and pat the mixture into a ball. On a lightly floured surface, roll the dough into a circle 1.5cm (3/4 inch) thick. Use a 6cm (2 1/2 inch) pastry cutter to cut out four or five biscuits and then gather the scraps to make one or two more biscuits so you have six in total. Place the biscuits on top of the cobbler and brush them with the egg. Bake for 20-25 minutes until the biscuits are puffed and golden and the cobbler is bubbling away. Serve with a little yoghurt if you wish and a green salad. We are in the midst of a real crisis in food production. Increasingly farmers and food producers are being paid well below an economic level for their produce and the general public seem totally unaware. Dairy farmers, encourage to increase their herd sizes and milk production are now getting 22 cents a litre from the farm – last time I checked it cost between 0.75c and 1.29 cents a litre in the supermarket. Where’s the fairness in that and what gives the rest of us the right to assume that cheap food at any cost is our right. The farmers and fishermen are caught in a helpless stranglehold in the battle between the multiples often having over borrowed to meet a promised demand. There are indeed many who cannot afford to spend any more than they do on their weekly food shopping but there are also many who knowing the situation would happily pay a little more if they were sure the money was going back to the food producer. I don’t know the answer – I wish I did but an answer we must find soon……. I’m also amazed at the number of people who do not understand that ‘buy one get one free’ does not mean that the supermarket is providing the second item free, rather it is the producer who often has no option but to do so which further depresses their income even further. At least, the conversation about food waste is gathering momentum. There are now many initiatives including Food Cloud, Bia Food, Stop Food Waste and Fruta Feia – Ugly Veg. In 2013 its founder Isabel Soares set up in Portugal an initiative to combat food waste by selling at bargain prices some of the perfectly edible fruit and vegetables that are not currently reaching the consumer for mere aesthetic reasons. The project model works on a cooperative basis. Every week, Fruta Feia buy misshapen fruit and vegetables directly from the farmers who cannot sell them on the regular market because of EU regulations and supermarket demands for uniformity. They, then sell at half the regular price of perfect produce, so the farmers see a much higher % of their crop and the general public are only too happy to buy the produce that the supermarket consider ‘garbage’. At present there are over 3,000 people on a waiting list for the Fruta Feia box scheme. They have just been awarded a European Commission grant of €300,600 to roll the model right across Portugal. This is music to my ears. After years of being outraged by the wanton waste created by the notion that undersized or oversized ‘uglier’ fruit and vegetables were less saleable or nutritious or delicious. There is another element I love about Fruta Feia, volunteers run workshops in primary schools to teach children about food waste and why they shouldn’t shun produce that looks less than perfect. Surprise, surprise, they find that children are very receptive to the message and think ugly fruits are funny and appealing…. This is timely at the start of the new growing season. We’ve been feasting on rhubarb over the past few weeks and I’ve just enjoyed the first of the seakale, asparagus and new potatoes. The latter were planted on December 22nd 2015 and are grown in the greenhouse. The new potato crop will be harvested out just in time to plant salad leaves. I’m not a deeply religious person but each new year when I taste the first of these delicious crops, fresh from the farm and garden, I give thanks to the good Lord and Mother Nature for the earth’s bounty, but also to the farmers and food producers who work day in and day out to produce food to nourish and sustain us. They deserve to be appreciated and adequately paid for their efforts. At this year’s Litfest, Canadian writer, Susan Musgrave, who has been described as everything from a standup comedian to an eco-feminist will be talking about her latest book and first cookbook, A Taste of Haida Gwaii in the Ballymaloe Cookery School on Sunday May 22nd. Susan has received several awards in different categories of writing, poetry, fiction, non-fiction, personal essay, children’s writing and for her work as an editor. She has published close to 30 books. She lives on Haida Gwaii and teaches poetry at the University of British Columbia. A trip to Burma, now known as Myanmar, was one of my most intriguing adventures of 2015. Burmese food is virtually unknown outside the country, but word of its unique multi-ethnic cuisine is spreading throughout the culinary world. Delicious salads, soups, dahls, curries, noodle and rice dishes with intriguing Thai, Indian and Chinese influences, reflecting its geographical location. When I came home, we cooked many of the Burmese recipes I’d tasted and learned in the restaurants, cafes and tea-shops of Yangon, Heho, Lake Inle, Mandalay, and Bagan to a hugely enthusiastic response. On Friday May 27th , we’ll teach a Flavours of Burma course, and introduce you to the essential elements of Burmese cooking and provide a repertoire of recipes that can be reproduced with ingredients, readily available from your nearest Asian shop. Sieve the flour into a bowl and rub in the butter until the mixture resembles coarse breadcrumbs. Mix in the egg to bind the pastry. Add a little water if necessary, but don’t make the pastry too sticky. Chill for 15 minutes. Then roll out the pastry to line the quiche tin or flan ring to a thickness of 3mm (1/8 inch) approx. Line with greaseproof paper and fill to the top with dried beans and bake blind for approximately 20 minutes in a moderate oven, 180°C/350°F/Gas Mark 4. Remove the beans, egg wash the base and return to the oven for 1-2 minutes. This seals the pastry and helps to avoid a ‘soggy bottom’. Melt the butter, add the olive oil and onions; sweat the onions with a good pinch of salt until soft but not coloured. Cook the asparagus in boiling salted water until al dente, then drain. When it is cool enough to handle, cut into 1cm (1/2 inch) pieces. Whisk the eggs in a bowl; add the cream, almost all the cheese, onion and the cooked asparagus. Season with salt and freshly ground pepper. Pour into the pastry case, sprinkle the remainder of the cheese on top and bake in a moderate oven 180°C/350°F/Gas Mark 4, for 40-45 minutes. Place all the ingredients for the Romesco sauce in a small bowl, along with 1 teaspoon salt and a good grind of black pepper. Stir well, and then leave in the fridge to marinate for 4 hours or preferably overnight. Transfer to a food processor and blitz to form a paste. Place in a small pan and warm through just before serving. Bring a medium saucepan of salted water to the boil and add the asparagus. Blanch for 1-2 minutes, until al dente, then strain and refresh under cold water. Set aside to dry. Place the balsamic vinegar, apple juice and caster sugar in a small pan and place on a high heat. Cook for 4-5 minutes, until it has reduced by half and has a thick, sticky consistency. Place a ridged griddled pan on a high heat. Toss the asparagus with the olive oil and 1 teaspoon of salt and put them on to the griddle pan. Chargrill for 2 minutes, turning halfway through so that both sides get scorched. 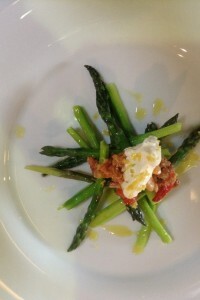 Spread the Romesco sauce on individual plates and place the asparagus on top. Drizzle the balsamic reduction on top, sprinkle over the flaked almonds and serve. Serves 2 lucky people, a last minute treat but so worth the wait. Put on two saucepans of water, one for the asparagus, and the other to poach the eggs. Heat a grill pan on a high heat to sear the bread. Cook the asparagus in 4cm (1½in) boiling salted water for 2-3 minutes, or until the tip of a knife will pierce the root end easily. Drain. Meanwhile crack an egg into a cup, then slide the egg into the other pot of barely simmering water. Repeat with the second egg. Cook gently for 3-4 minutes, or until the egg whites are set and the yolk is still soft. Meanwhile grill the bread on the hot pan. Take two hot plates, slather the grilled bread with butter. Remove the eggs one at a time with a slotted spoon. Pop one on top of the bread, arrange five stalks of asparagus alongside and at an angle. Drizzle with Hollandaise and sprinkle with finely grated Parmesan and a few flakes of sea salt. Coarsely grind some black pepper on top, serve and enjoy ASAP. This is a simple and gorgeous way to serve fresh Irish asparagus during its short season. We feast on it in every possible way for those precious weeks, roast, chargrilled, in soups, frittatas, quiches don’t forget to dip some freshly cooked spears in a soft boiled egg for a simple luxury. This was my father-in-law’s favourite way to eat Irish asparagus during its short season. Seakale is an exquisitely delicate vegetable much sought after vegetable in country house gardens in the 18th and 19th centuries. It is rarely if ever seen for sale in the shops but more adventurous garden centres now sell plants. It is relatively easy to grow, so is well worth cultivating. Replicas of the old seakale blanching pots with lids are now being reproduced, but a brick chimney liner covered by a slate works perfectly well. Even a black plastic bucket, though not aesthetically pleasing will suffice. Seakale thrives with a mulch of cinders. Sow in spring and cover them with seakale pots or chimney liners and a slate to exclude the light in about November, then you will be rewarded with pale delicate shoots in early April. Seakale is perennial and visually it is altogether a beautiful plant with white flowers in summer and lots of bobbly seed heads in autumn. Seakale is divine served with the first wild salmon or with some lobster or Dublin Bay prawns. One rarely has an abundance of seakale but one of our favourite ways to serve it at Ballymaloe is on toast with melted butter or hollandaise sauce. Wash the seakale gently and trim into manageable lengths – say 10cm (4inch) approx. Bring the water to a fast boil and add the salt. Add the seakale, cover and boil until tender – about 15 minutes. Just as soon as a knife will pierce the seakale easily, drain and serve on hot plates with a little hollandaise sauce or melted butter and lots of toast. Mix the cornflour into the water. Put the flour into a bowl. Add the water gradually, stirring with chopsticks, it will be a bit lumpy at first but a will eventually be a light creamy texture. You may need to adjust the consistency by adding a drop more water or flour to get a thin even coating batter. Heat the oil in a deep fry to 180C. Trim the seakale and cut into pieces 10-11.5cm. Dip one piece into the batter and fry for a couple of minutes or until crisp but not brown. Taste for seasoning and adjust the batter if necessary. Continue to cook the rest, drain on kitchen paper. Thin the mayonnaise with a little water to a dip-like consistency. Add lots of finely chopped chervil and a nice sprinkling of sea salt. Serve the crisp tempura immediately with a little bowl of chervil mayonnaise.